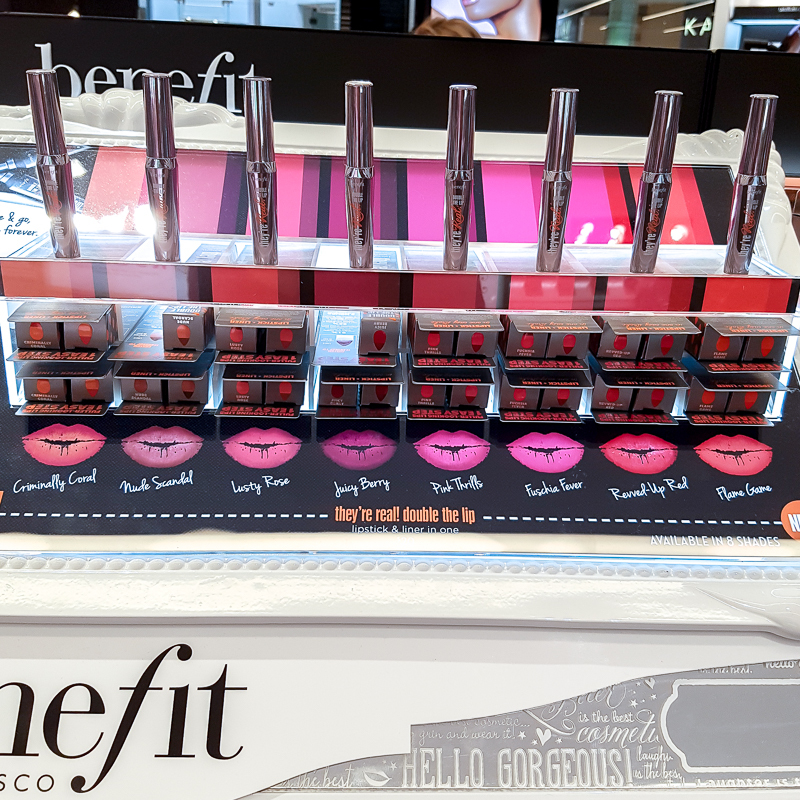 The ombre lip trend seems to be a popular one this year, and Benefit has been quick to hop on with the newly launched Benefit They're Real! Double the Lip. These are a touted as a lipstick and lipliner in one product, with a tear-drop shaped tip that does all the work for you. Each lipstick (or liner-lipstick hybrid) contains two colors - a darker shade that would work as the lipliner, adding definition around the edges and preventing feathering of the lip color, and a lighter shade that acts as a lipstick, filling in color and adding volume to the lips. 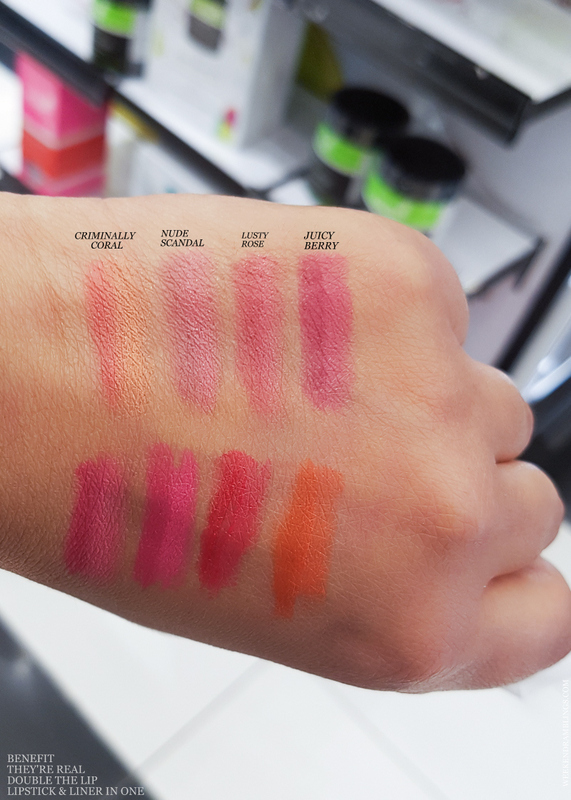 Scroll on for swatches. I have unevenly pigmented lips, so I amn't too enamored by the lip-contouring/ombre lip trend, but I do love the idea of having two lip colors or a liner and lipstick in one product. Benefit They're Real! 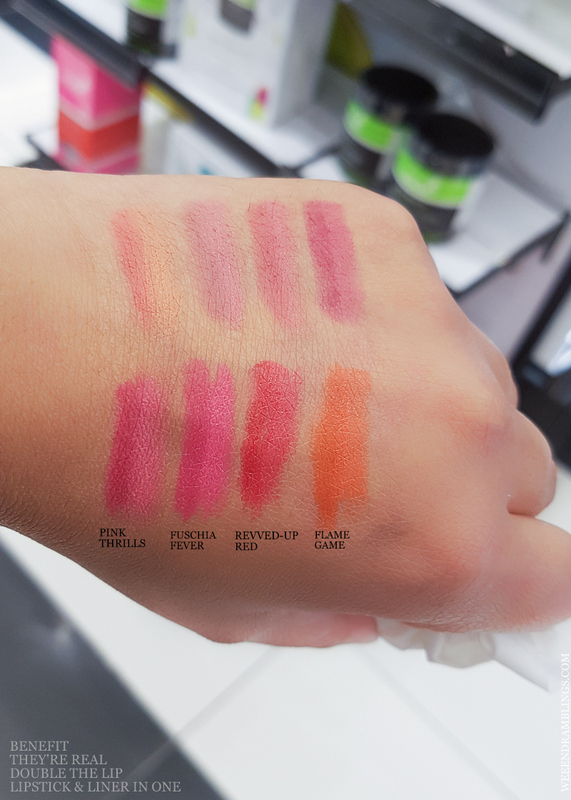 Double the Lip seems to do this in theory, and while I can see the darker and lighter shades quite clearly in the lip product, on swatches at least, the effect is a subtle gradient (at best). I like that that gradient isn't too obvious, but some of the colors don't really show up as distinct lighter-darker shades. It is easy to get a precise application of the desired color when the tube is new and the tear-drop shape is intact, but I amn't sure how well this would work as the sharply defined shape gets rounded with use. I do like the colors in this range, a mix of neutrals and some fun corals and pinks, most of which would work well across a range of skin tones. The formula applies smoothly and has a satin finish. Overall, a fun product to try out, especially if the ombre lip trend appeals to you.